Why we exist begins with a belief. Wouldn’t it be great if that belief was true for all our children? If every child had a grandpa that spent time playing, sharing and getting to know his grandchildren. Wouldn’t it be fantastic if every grandpa shared his stories and helped his grandchildren learn from the experiences of his life? Wouldn’t it be fabulous for every child to feel a special love that a grandpa can provide? But for three generations the children in my family didn’t have that opportunity. My dad didn’t know his grandpa. I didn’t know my dad’s dad. And my children never got to meet mine. All three of the grandpa’s in our family passed away before they could meet their grandchildren and influence our lives. That’s the order of things and the cycle of life. There are other reasons that grandpa might be absent. Sometimes it’s because he’s busy chasing his career. Climbing ladders and missing out. For others, it might be his physical condition, lack of energy, or because he just forgot how to play. I didn’t give the absence of a grandpa in my life a lot of thought as I grew up. He wasn’t there, and I didn’t know what I was missing at the time. But now I do. And I’ve decided that the absence of a grandpa in our family stops with me. 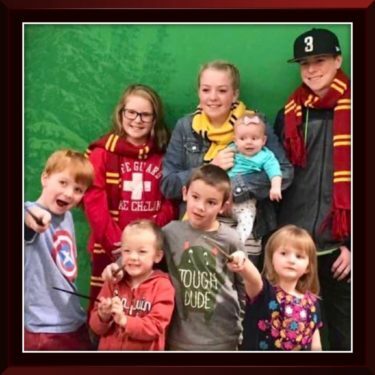 I’ve been blessed with nine beautiful grandchildren. A few years ago we all came together from our homes in five different states to celebrate my 60th birthday. It was a wonderful week and deserves its own story which I’ll share later. It was that week with my grandchildren that helped me realize and remember how very precious and limited our time together can be. 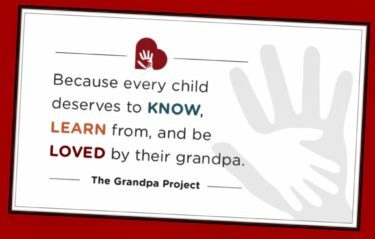 It was the beginning of a journey that led me to The Grandpa Project – where our mission is to help men consider the value they bring to their grandchildren’s lives, and to enable children to experience a loving relationship with their grandpa. Thanks for being here as the journey unfolds for us all. If you believe, as we do, that all children deserve to experience a loving relationship with their grandpa, and if you’d like to share a story of a relationship you experienced or observed, please let us know. Whether you’re a grandpa, a grandchild, or simply know someone who is, your story matters. Drop us a line and we’ll be in touch.